It’s nighttime. You’re not at Yesterland. You’re at Yester California Adventure. The “creative spirit of California” gets top billing over “the magic of Disney.” This is the park whose mission is to celebrate the great state of California. Guests have enjoyed this parade at the original Disneyland Park, Magic Kingdon Park at Walt Disney World, Tokyo Disneyland, and Disneyland Paris—always on Main Street, U.S.A. But Performance Corridor Electrical Parade would be a silly name. 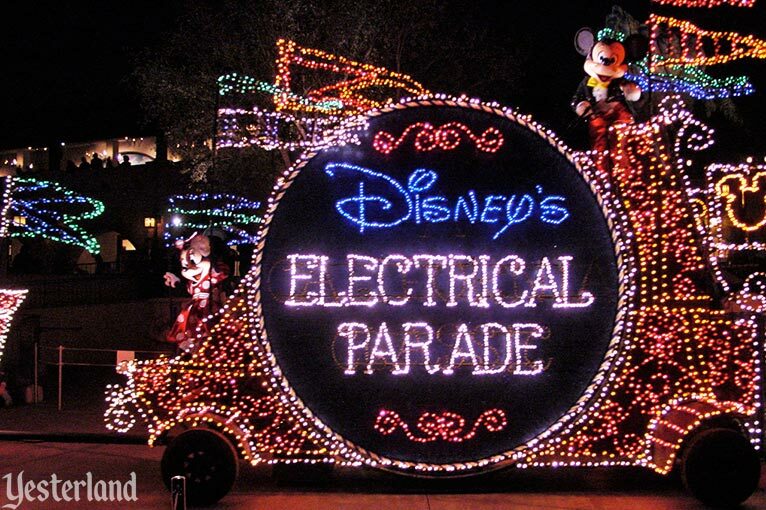 Yes, this is Disney’s Electrical Parade—not the Main Street Electrical Parade. 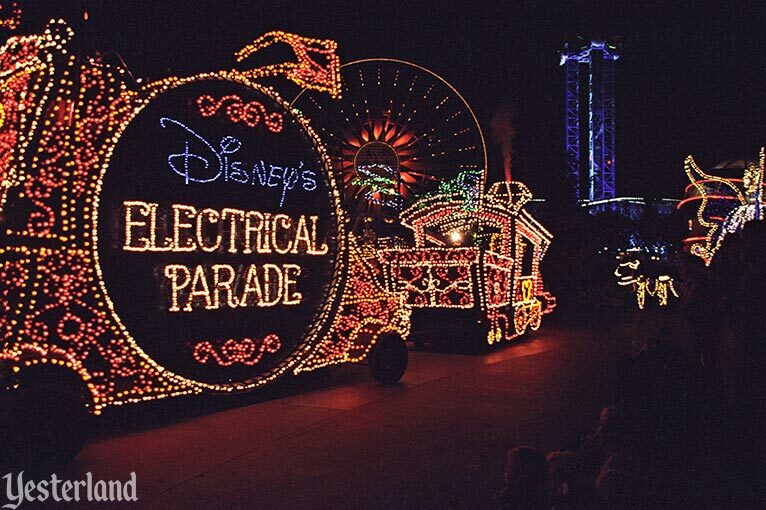 After a run at Disneyland Park that lasted from 1972 to 1996, with just a few years off for other parades, the Electrical Parade is probably familiar to you and most of the guests around you. 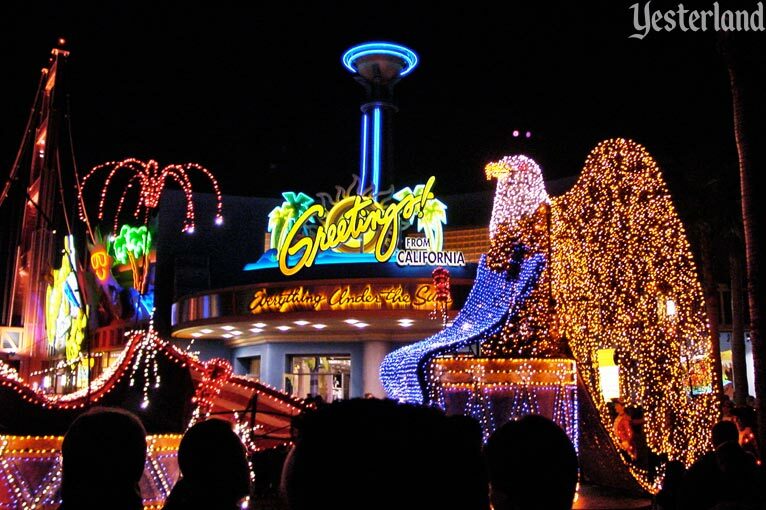 As expected, parade units with more than 500,000 colorful lights showcase scenes and characters from Disney movies. The main musical theme is the incredibly catchy “Baroque Hoedown” by Jean-Jacques Perrey and Gershon Kingsley. Other tunes are woven in to go with the various parts of the parade, all in the same “electrosynthomagnetic” style. 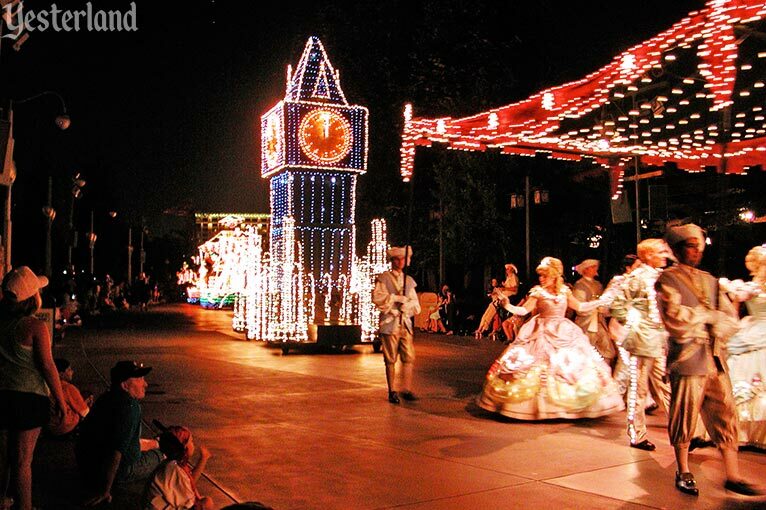 The 23-foot-tall Clock Tower over Cinderella’s Ball is particularly impressive. Ballroom dancers covered in tiny glowing bulbs dance below a canopy of lights. As part of the parade’s Circus Unit, King Leonidas of Naboombu plays the calliope. Why such an obscure character? Because Bedknobs and Broomsticks (1971) was a recent Disney feature when the parade premiered in 1972. The parade’s grand finale, “To Honor America,” features a 108-foot-long red, white, and blue flag and a proud American Eagle. Whether it’s called Disney’s Electrical Parade or the Main Street Electrical Parade, it’s a memorable parade that can be enjoyed again and again. Just don’t call it the Electric Light Parade. Many people do, but that’s never been its name. Back in 1996, Paul Pressler had been president of Disneyland. 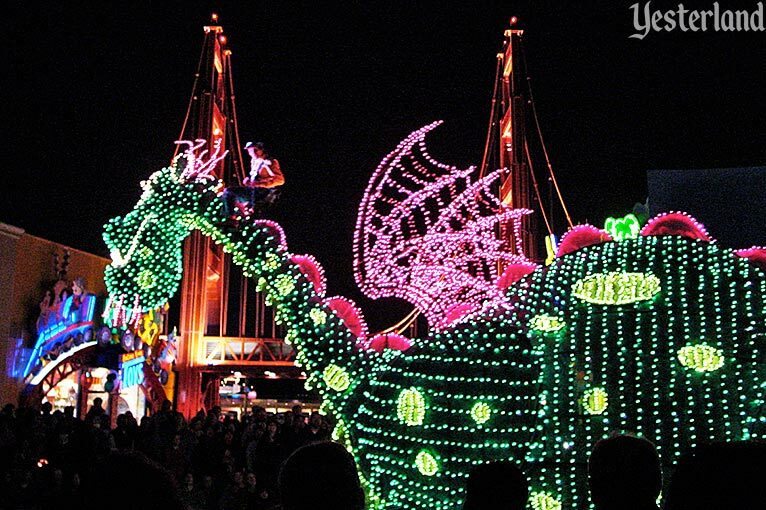 That year, his “Farewell to the Main Street Electrical Parade” marketing campaign invited park guests to see the parade one last time, “before it glows away forever.” Disneyland Park set attendance records—with financial results to match. It was one of the factors that propelled him into the chairmanship of the entire Disney Parks & Resorts business segment in 2000. His lieutenant, Cynthia Harriss, became the new head of Disneyland. 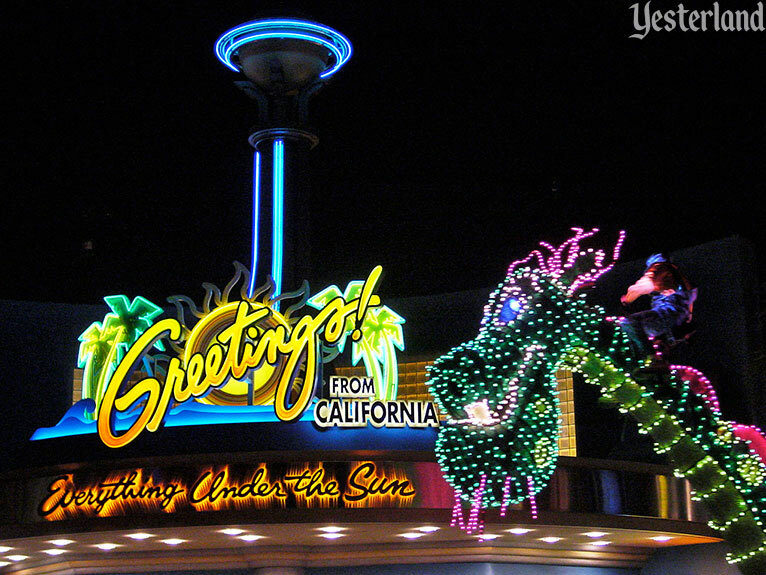 Disney’s California Adventure opened in February 2001. When expected attendance levels failed to materialize, Pressler and Harriss had to take quick action. 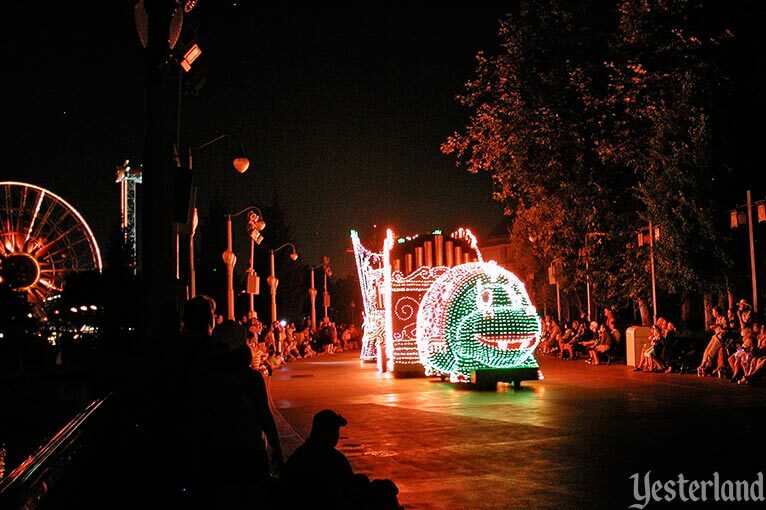 It’s not surprising that their first big initiative involved the Main Street Electrical Parade. If killing the parade could work such wonders, how about bringing it back from the dead? 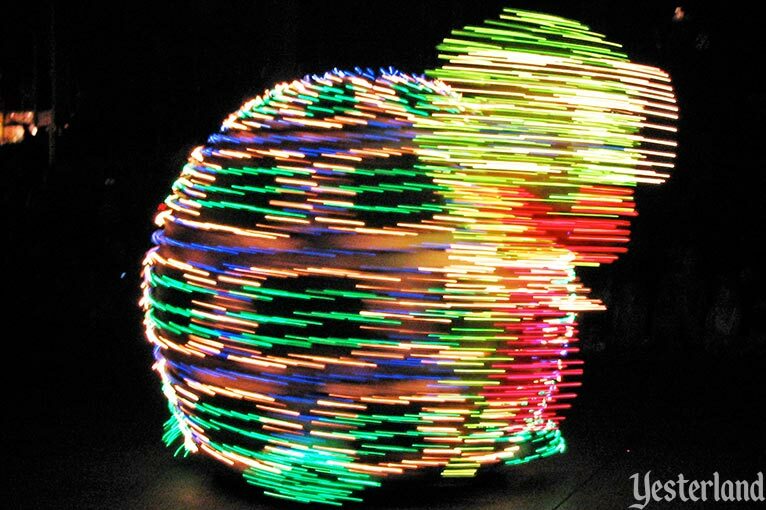 “Disney’s Electrical Parade has for years served as a global ambassador for Disney theme park family entertainment. It is time to bring the pageant home,” Harriss says. Between the time that it closed at Disneyland and opened at California Adventure, guests could enjoy the parade at Magic Kingdom Park and Disneyland Paris. The Walt Disney Company owned two copies of the parade from the time when there were concurrent runs in California and Florida. 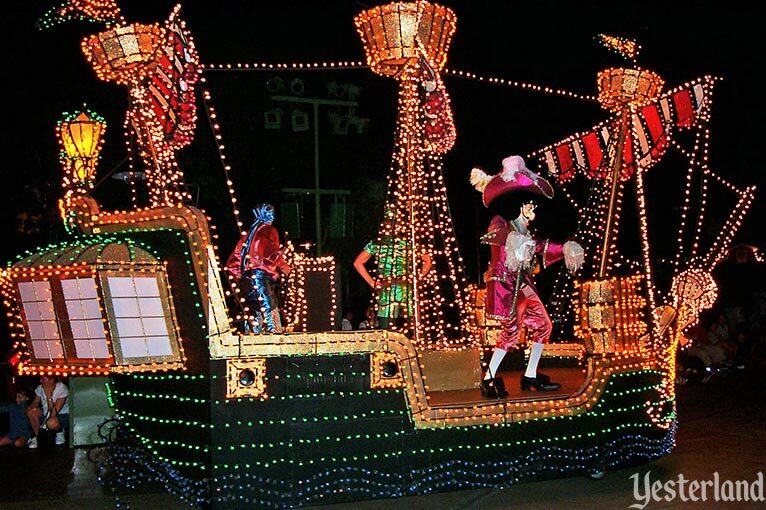 One night in June 1997, the parade performed in New York City as The Hercules Electrical Parade to promote the premier of that Disney movie. 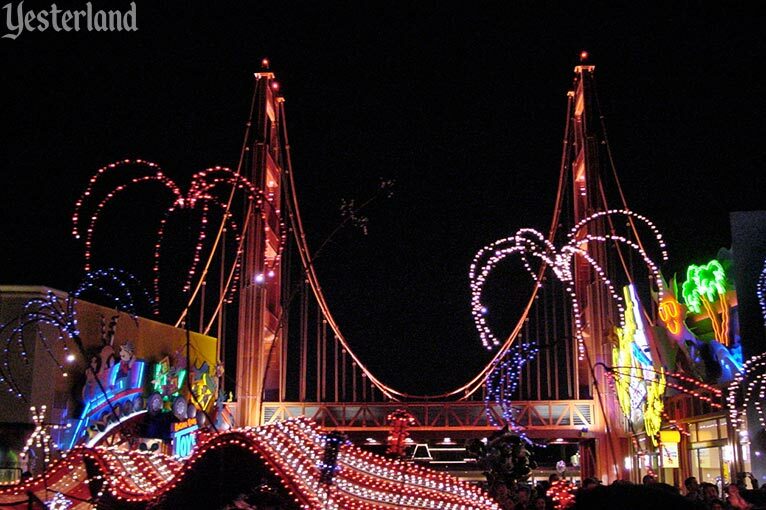 Disney’s Electrical Parade had its first public performance at California Adventure on July 2, 2001. If the parade was meant to provide an instant fix to the park’s attendance problems, it failed. But the parade succeeded in delighting guests. Those with Park Hopper tickets and two-park annual passes could spend the day at Disneyland Park and then hop over to the new park in the evening for the parade. 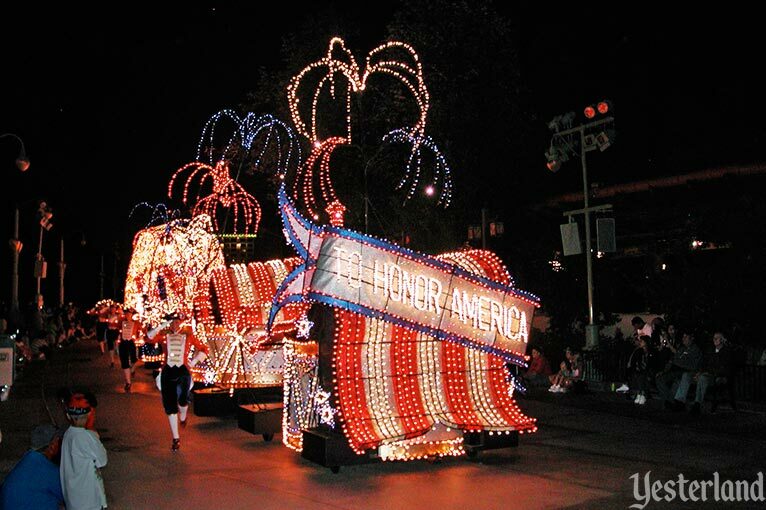 In 2006, Disney’s Electrical Parade gained a sponsor, the Sylvania lighting division of Siemens. The parade continued at California Adventure, even after construction walls lined much of its route toward the end of its run. 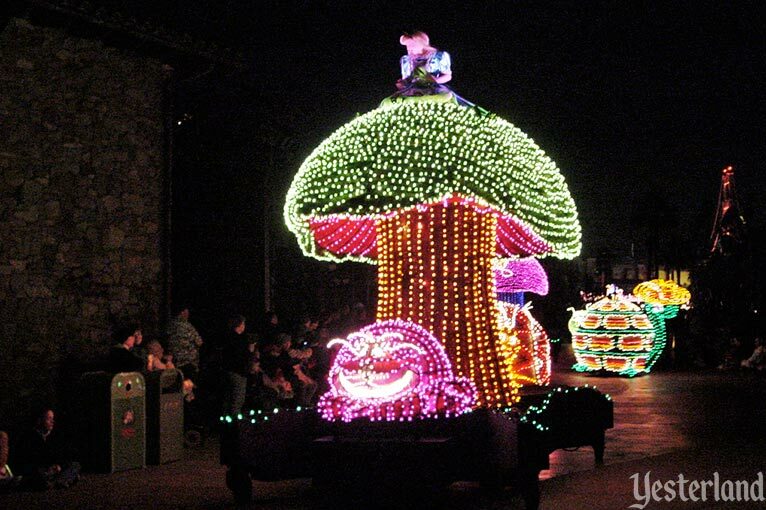 The parade even received a significant upgrade in 2009, with eco-friendly LED lighting, a new Tinker Bell float, the return of long-missing floats, and updated sound technology. Lasting not quite nine years at California Adventure, Disney’s Electrical Parade ended its run April 18, 2010. 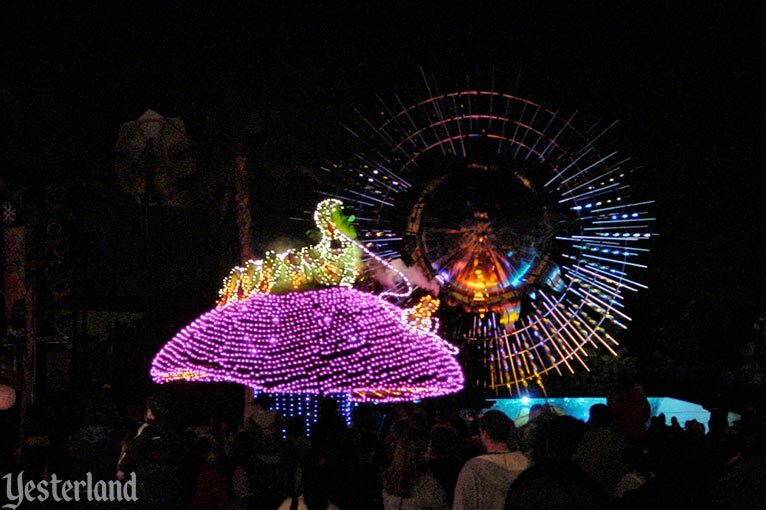 With the crowds that the new World of Color lagoon show would bring to the parade route beginning June 11, 2010, the nighttime spectacular parade would have led to a spectacular nightmare each evening if it had stayed. 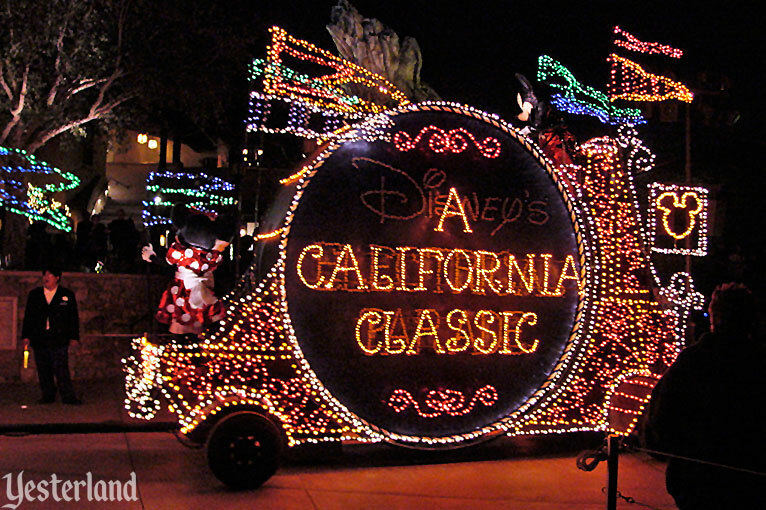 Disney’s Electrical Parade has not returned to Disney California Adventure. But the Main Street Electrical Parade—the parade whose final “glow away forever” season at Disneyland Park was 1996—returned to that park in 2017.